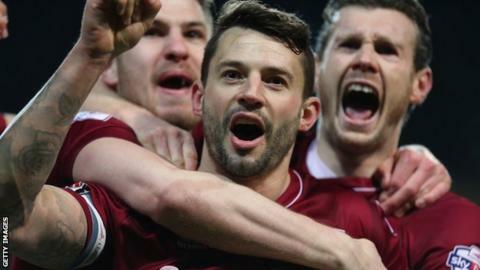 Northampton equalled a 56-year-old club record as Marc Richards' penalty gave them an eighth successive victory - at the expense of promotion rivals Oxford. Richards struck just before the hour mark, after John Mullins was penalised for handling the ball in the area. The hosts managed just one shot on target in the game and winger Chris Maguire also struck the post. Northampton are now eight points clear of second-placed Plymouth at the top and 18 ahead of Accrington in fourth. Meanwhile, Oxford remain the in automatic promotion places, six points clear of Accrington despite the defeat. Match ends, Oxford United 0, Northampton Town 1. Second Half ends, Oxford United 0, Northampton Town 1. Substitution, Northampton Town. Jason Taylor replaces James Collins. Lawson D'Ath (Northampton Town) wins a free kick on the right wing. Lee Martin (Northampton Town) is shown the yellow card. Corner, Northampton Town. Conceded by Jonjoe Kenny. James Collins (Northampton Town) wins a free kick in the defensive half. Attempt missed. Lawson D'Ath (Northampton Town) left footed shot from outside the box misses to the left. James Collins (Northampton Town) wins a free kick in the attacking half. Attempt missed. Sam Hoskins (Northampton Town) left footed shot from the right side of the box is close, but misses to the right. Substitution, Oxford United. Zeli Ismail replaces Chris Maguire. Corner, Oxford United. Conceded by David Buchanan. Corner, Oxford United. Conceded by Rod McDonald. Attempt missed. Chris Maguire (Oxford United) left footed shot from outside the box is too high. Lee Martin (Northampton Town) wins a free kick in the defensive half. Substitution, Oxford United. Cheyenne Dunkley replaces Jake Wright. Substitution, Northampton Town. Sam Hoskins replaces Ricky Holmes. Substitution, Oxford United. Callum O'Dowda replaces Danny Hylton. Attempt missed. Liam Sercombe (Oxford United) right footed shot from the centre of the box is close, but misses to the left. Substitution, Northampton Town. Lee Martin replaces Marc Richards. Chris Maguire (Oxford United) hits the left post with a right footed shot from outside the box. Corner, Northampton Town. Conceded by Jake Wright. Goal! Oxford United 0, Northampton Town 1. Marc Richards (Northampton Town) converts the penalty with a right footed shot to the high centre of the goal. Penalty conceded by John Mullins (Oxford United) with a hand ball in the penalty area.